Roger Ebert didn’t particularly like this movie. He especially noted that the lack of realism was something that he didn’t enjoy, given how little of the pain and suffering that people go through in life was actually shown. I couldn’t disagree with him on that front; after all, he did undergo surgery of his own, and I am sure that it wasn’t a particularly pleasant experience for him either. Watching this movie, then, perhaps touched more than just a note with him. Perhaps if I had gone through the same thing, I would feel the same way. Nevertheless, it has to be said that this film was never meant to be a downer of a film. Yes, it deals with death (eventually), but ultimately, it asks the question of what we would do given the choice. If we were to die, how would we react? Quite frankly, I’d like it to be in this way. Carter Chambers (Freeman) and Edward Cole (Nicholson) are as different as chalk and cheese. Carter is a mechanic, while Edward is a hospital owner. Blue collar and white, black and white (though this wasn’t highlighted in the film), rich and not-so-rich. In short, they’re about as different as different can be. Only trouble is, the one thing that the both of them have in common is cancer. As such, both of them happened to be admitted to the same room. From here, the journey of the two of them, and the film, truly begins. "I'll have some breakfast soon, because it's nearly time to break my fast. Ha ha." Their reactions to being hospitalised and diagnosed are also different. Carter came up with a list of things to do before he kicks the bucket (hence the film’s title), but was devastated to learn that he has only a year to live. In short, he couldn’t do all of the things that he wanted in that time period. Edward, however, having become fond of him, pushed Carter on, telling him that he will go on the journey with him. With the help of his own personal assistant, Matthew (who he insists on calling ‘Thomas’), they embark on a journey around the world, and doing (and adding) all the “fun things” that Carter wanted to do. The re-run of FRIENDS is still funny. 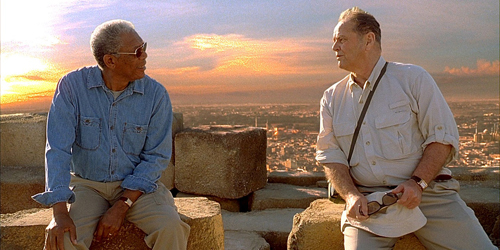 In watching this movie, I am reminded why Morgan Freeman has remained a top draw of an actor for a long time. Not only his activeness is highlighted here, but also of his ability to somehow morph into different roles, almost at will. There are many elements of his character that reminds you of who he is, yet he also did a good job of evolving, ensuring that his character doesn’t feel particularly recycled from movies of yesteryear. 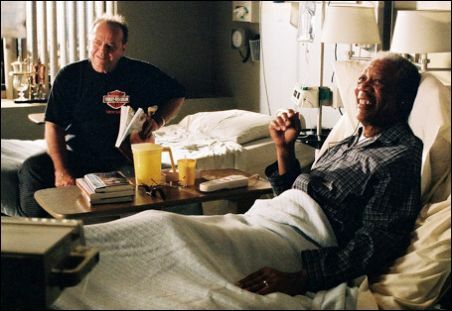 Jack Nicholson, on the other hand, remains…well, Jack Nicholson. You feel like you’ve been there and seen it all before, but somehow you can’t quite get enough of it. 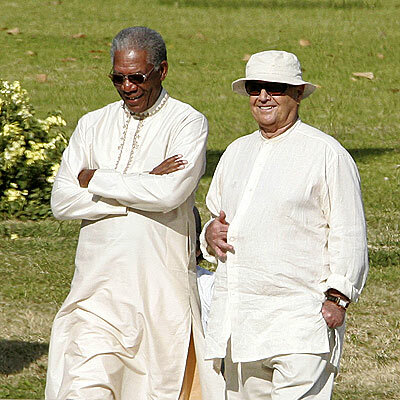 However, unlike Morgan Freeman, he seems to be a bit more stingy with his time, preferring to step back from the silver screen and do other things. No one could begrudge that, but should it become a longer term of exile, it would be a pity. There are few actors more charismatic than he is. Proof: Lucius Fox and The Joker are on the same side! Despite all the air-headed fun, there are still moments in the film that brings it down to earth. Carter debated and argued with his family extensively about his choice to do the things that he wanted to do. His family, understandably, wanted to spend as much of their own time with him as possible. It was a moment that I rarely see in other movies that deals with the same subject matter. I am reminded of ‘Y Tu Mama Tambien’, the classic Mexican movie that launched Gael Garcia Bernal and Diego Luna’s careers in Hollywood. In it, another character in a similar situation also decided to go on the pair’s hedonistic trip. Though it was fun, it reminds me that many films treat their characters in isolation to their respective relations. Friends and family tend not to play a big part in those films, and perhaps they weren’t meant to. While I am not saying that it is a bad thing, it is something that is brought out strongly in this film. 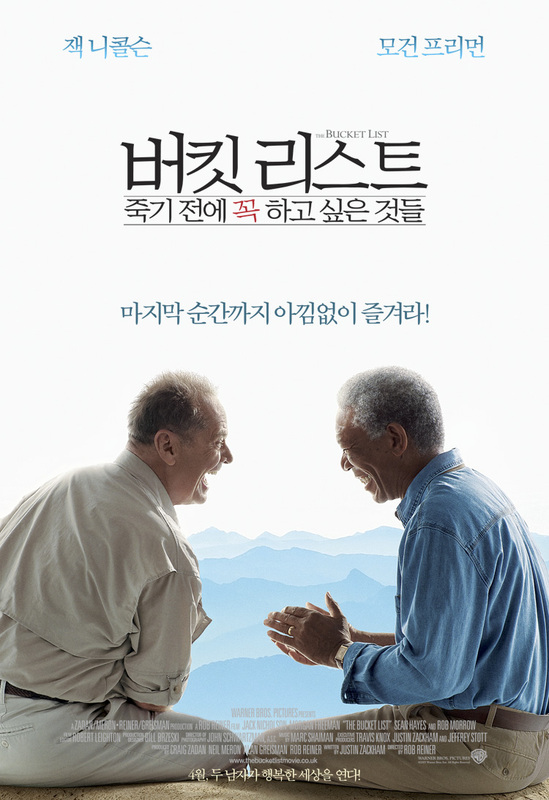 It is about two men wondering how to spend the rest of their lives, but it is also about the consequences of those decisions on those close to them. It is a poignant element that adds depth and realism to this film (even more so, I hasten to add). 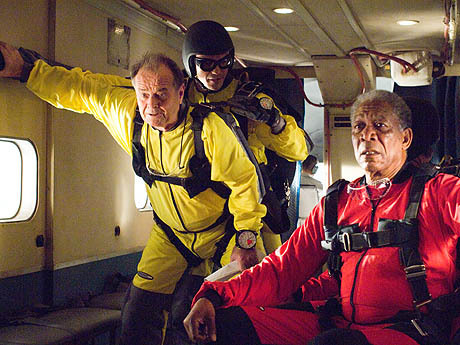 "I thought you said para shoot, not parachute!" Amazing, then, to consider that the script was written in two weeks. There was plenty of heart and moments of inspiration in the script, which manages to round everything off nicely. It’s not the most original script in the world, but then again, what is originality? It doesn’t help that some of the scenes were slightly strangely lit (can’t quite put my finger on it, but the scenes atop a pyramid was a bit ‘off’ to me). Nevertheless, that’s a case of picking over the slight tear inside the coat while everything else looks good. Sometimes, you’re just looking for a nice little movie to get lost into for about two hours or so, one that probes a little bit at your heart and mind, but ends up entertaining and rounding up all the circles started in the film. ‘The Bucket List’ is such a film. Fikri has listed his buckets, and realises that he has…none.